There are times when words fail us — when they do not capture the depth of overwhelming situations we sometimes face in life. For the Church in the United States this is one of those times. The crisis we face is the product of clerical sins and clerical failures. As a Church, the conversion, transparency and accountability we need is only possible with the significant involvement and leadership of lay men and women in our Church, individuals who can bring their competence, experience and skills to the task we face. We need the help of the laity to address this scourge on our people and Church. If the Church proceeds with deep recognition of these realities the future can hold the opportunity to earn back trust, confidence and support from the community of Catholics and our society. We must proceed quickly and with purpose; there is no time to waste. On Sunday, I went to St. Patrick’s Parish in Roxbury for a celebration with the Cape Verdean community in the parish, which was one of our first Cape Verdean communities in the Archdiocese of Boston. 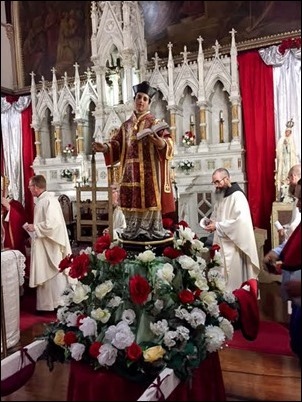 The Mass was held because we had just celebrated one of the major feast days for the Cape Verdean community — the Feast of St. Lawrence Martyr, who is the patron of the island of Fogo in Cape Verde. In the 1970s, Cardinal Medeiros invited the Capuchins from the Torino province in Italy who were working in Cape Verde to work with Cape Verdean immigrants in the United States. Among the friars who came here was the famous Padre Pio Gottin who worked with the Cape Verdean community in Roxbury, as well as New Bedford and Brockton. Padre Pio is the founder of the community of sisters, the Franciscan Sisters of the Immaculate Conception, and some of the sisters also came with him to St. Patrick’s. He passed away in 1999 but is still very fondly remembered. So, the Capuchins have been working with the community for many years and, in fact, two Capuchins have arrived recently, Father Bernardino and Father Samuel, who will be working with the Cape Verdeans in St. Peter’s Parish. Father John Currie is the pastor of these two communities and we are very happy that he was there with us along with Father Jack Ahern, the outgoing pastor who will be going to St. Gregory’s Parish in Dorchester. So, the Mass was also an opportunity for me to thank Father Ahern for his work and welcome Father Currie as well as the Capuchins who have arrived to help in the Cape Verdean ministry. 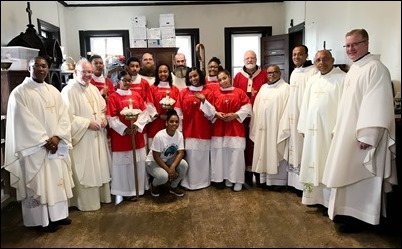 The Mass also marked the 25th anniversary of St. Lawrence Association of the Cape Verdean community, which besides organizing the feast also conducts many works of charity and social justice following in the tradition of St. Lawrence. St. Lawrence is one of the early Roman martyrs. He was born in Spain, perhaps in Valencia, which was then a province of the Roman Empire. He ended up in Rome, and the pope made him the Archdeacon for the Diocese of Rome, which meant he was responsible for the administration of the material goods of the diocese and for distributing alms to the poor. During that time, there was a rule that the goods of any Christian who was executed were to be confiscated. 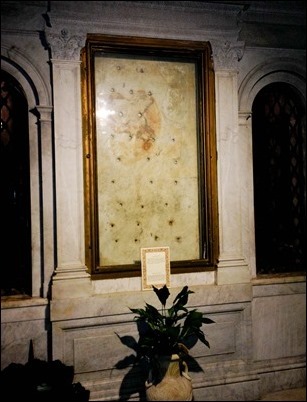 So when, during a persecution by Emperor Valerian, Pope Sixtus II was executed in 258, they came to St. Lawrence to demand that he turn over all the material goods of the Christian community to the Emperor. St. Lawrence immediately went out and distributed everything they had to the poor. Then, when the Emperor asked where the treasure was, he told him that the poor, the sick and the suffering were the Church’s treasure. For this, he was martyred by being burned alive on a grill. He is buried in the Basilica of St. Lawrence, one of the oldest basilicas in Rome, which was built over the site where he was martyred. In the basilica, they have the grill and his relics. 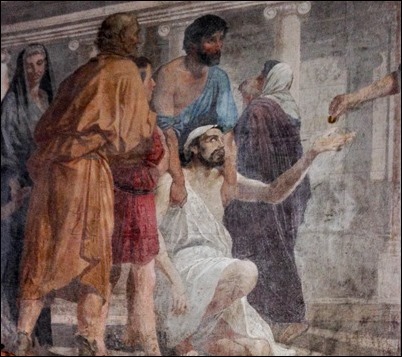 On the walls of the basilica there are many paintings depicting the life of St. Lawrence. 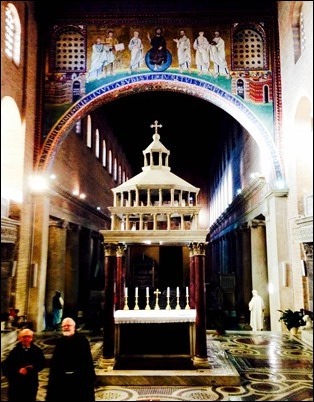 The Capuchin Friars have worked in that Basilica for many years. In fact, when I visited there in 2014, I met a friar who was a classmate of Padre Pio Gottin who had worked with the Cape Verdeans here in Boston. So, the feast is a beautiful tradition that underscores the Church’s commitment to caring for the poor, social justice and witnessing to the faith. After the Mass, there was a procession through the streets of Roxbury with the statue of St. Lawrence.